I’ve mentioned before that when I was growing up, we didn’t do much celebrating of Halloween. My mom doesn’t particularly like the holiday and so it was minimally recognized. One thing we did get to do, though, was BOO’ing our friends. I have three siblings and each of us would get to choose a family to BOO. 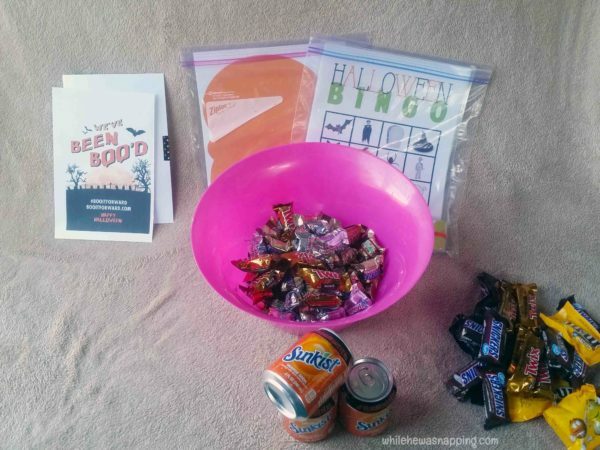 Some years, we would go all out and make fun Halloween cookies and treats to share and some years it was a little more simple. But, it wasn’t really about what was in the goody baskets, it was putting them together as a family. And, of course, delivering them was the best part! This is a tradition I wanted to share with my family now. We made three kits to share with some friends. I wanted something simple and easy. Life is busy and I just didn’t have hours to spend baking Halloween goodies. 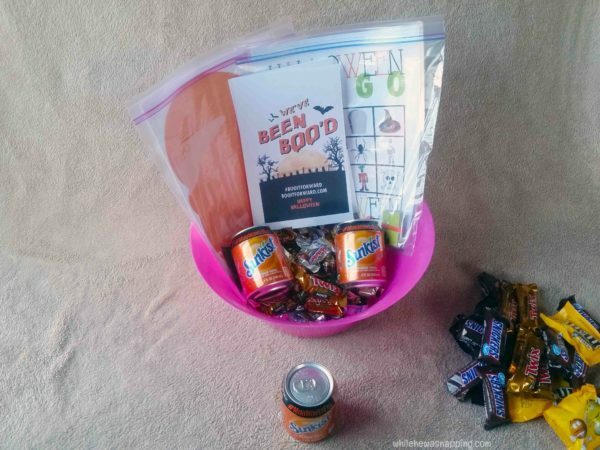 Lucky for me, MARS/Wrigley has an amazing BOO it Forward campaign going on and putting together our BOO kits was super simple. 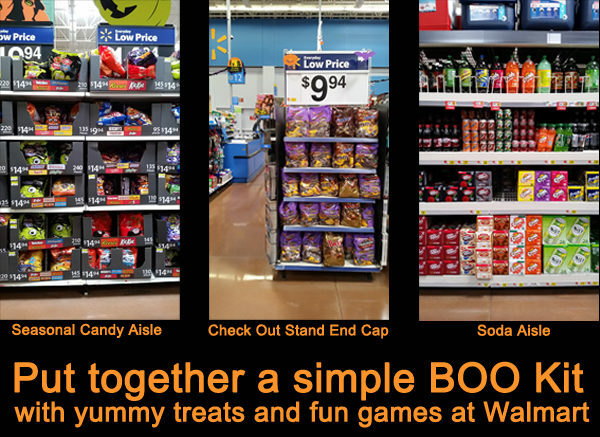 – We grabbed some of our favorite goodies at Walmart: some Sunkist® soda and an assortment of delicious MARS chocolates. I also grabbed a couple of big bowls that were on clearance to stash all our loot in. 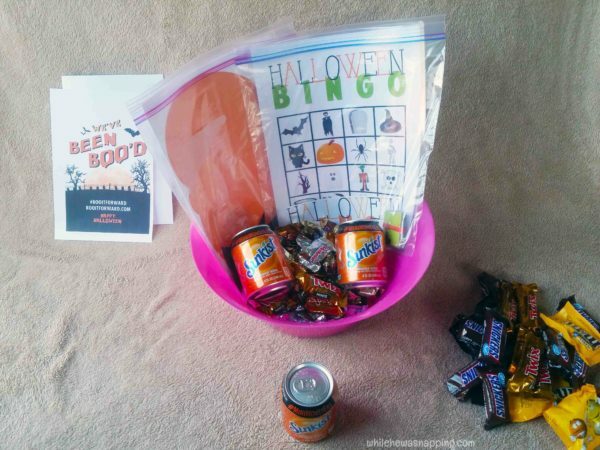 – I decided we should probably put in something else and it was Big J who thought of including the Halloween games we’ve been playing around here the last couple weeks. 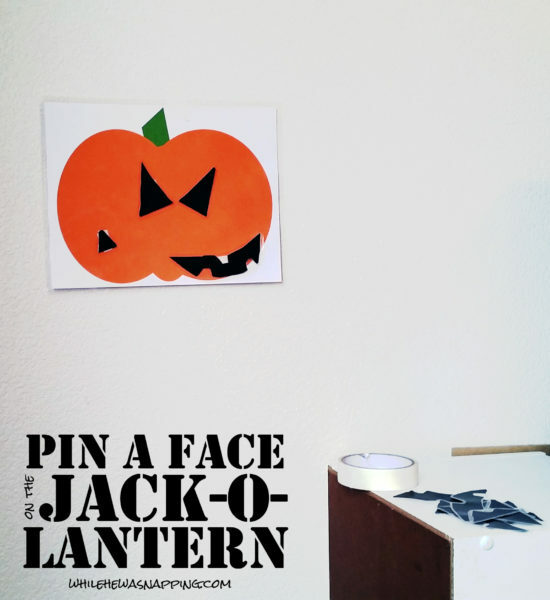 So, I made up a few more of the Pin the Face on the Jack-O-Lantern game and some more of the Halloween Bingo game I shared yesterday. We put them in ziptop baggies to keep them together. – I put the minis on the bottom of the bowl. 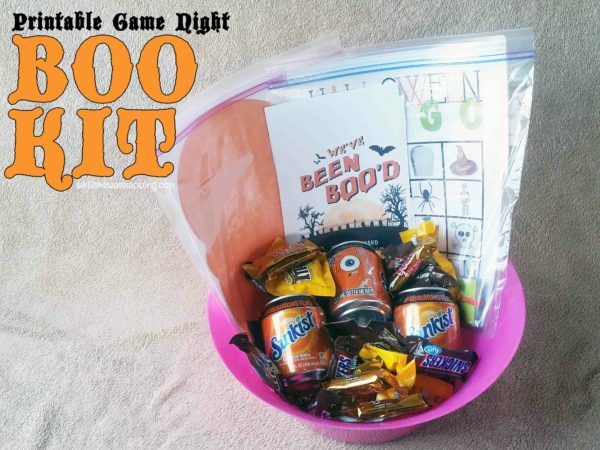 – Then, I tucked the games at the back, just under the mini candy bars. – Next, I stuck in two of the soda cans on each side of the bowl. 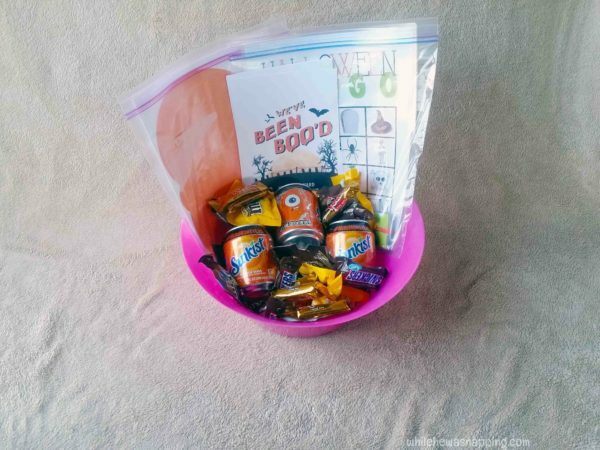 – I took the BOO It Forward printable card, folded it in half and taped it together with some fun Halloween washi tape. 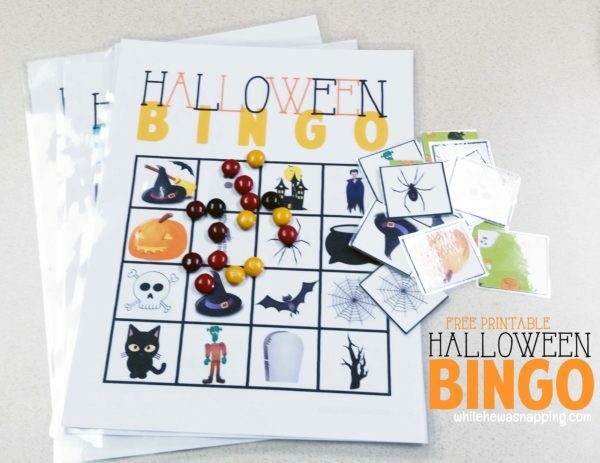 This will let your friends know how they can pass on the fun Halloween cheer. 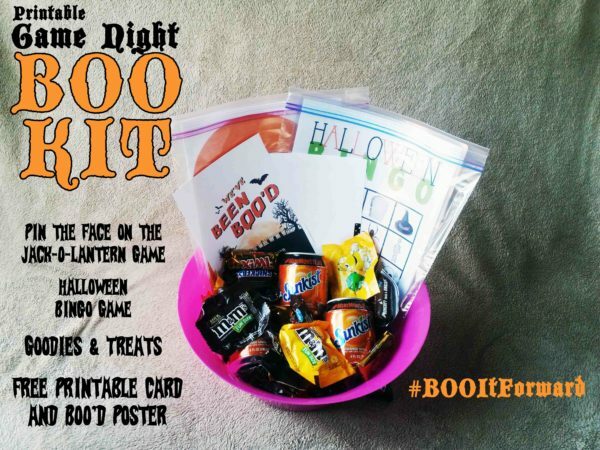 Cut the directions off the We’ve Been BOO’d poster and put that in with the card. Your friends can then hang the poster in their window so others will know that they have already been BOO’d once. 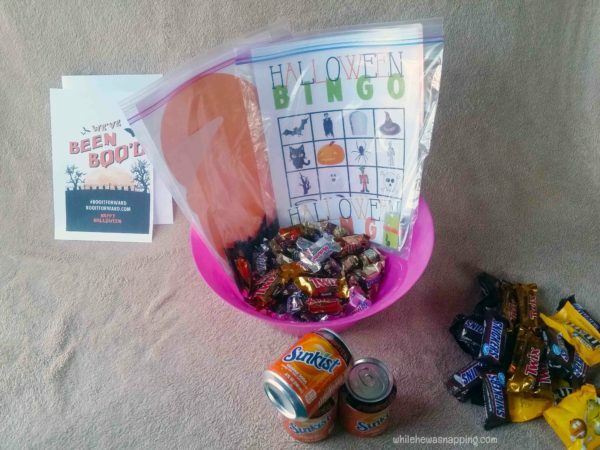 – Then, I put in the last can of soda and filled in the spaces with the fun size candy. We loaded the kiddos up in the car and delivered our three baskets. Mr. Napping and the two oldest boys left the goody baskets on the doorsteps while Baby N and I stayed in the car. And just like their momma, they thought the best part was the delivery! 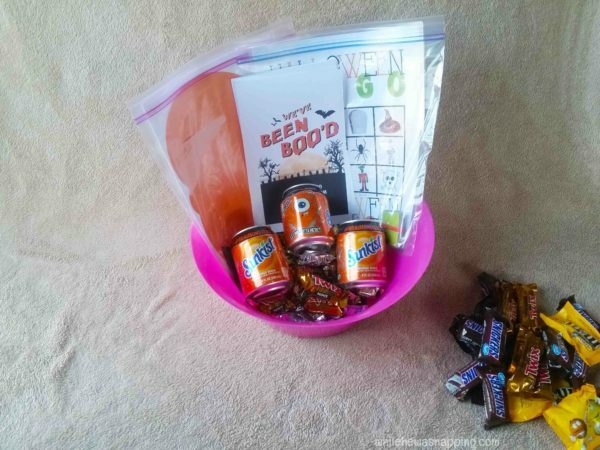 Who could you BOO to share the Halloween spirit? Check out more awesome BOO kit ideas and get out there and share some goodies!